We feature strip construction in this edition of Epoxyworks because of the wide range of projects we have seen over the years and the many we support on a daily basis. 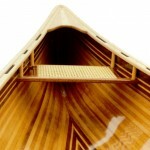 In most peoples minds, the beautiful, well-built stripper canoe almost defines the technique. But, we’ve also seen strip mailboxes and ships, cars and cradles, airplanes and artwork. The versatility of strip construction is well matched to the versatility of WEST SYSTEM® epoxy. We receive many questions about strip construction. We hope this issue of Epoxyworks answers many of your questions and opens up new ways to think about and use this most versatile of construction methods. Strip construction is a building method that uses long, narrow pieces (strips) of material joined on their edges to produce a continuous surface, forming the skin of a structure. It is usually supported by frames, bulkheads, fabrics or veneers running perpendicular to the strips. Although simple, flat structures can be produced this way, strip construction is ideal for rounded, or compound curved surfaces such as boat hulls. It has been around for many years and has evolved into many variations. Strip planking, as it is most commonly known, began as a method for planking round bottomed boats that was quicker and easier than carvel planking. It eliminated much of the spiling, steam bending and caulking that went with carvel construction. 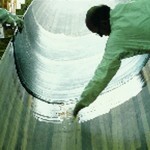 It became a more widely used method to build boats when water-proof adhesives became available. Resorcinol glues were used with edge-nailing of narrow (often square in section) planks over frames. The nails held the planks as the adhesive dried, and were left in place. They offered some cross-grain reinforcement along with the frames. Epoxy took strip planking a step further because it could fill gaps better than resorcinol and required only contact pressure during cure. Everything from rowboats to 250-ton commercial fishing boats are built using strip plank construction. Strip plank laminating combines strip planking and cold molding or laminating. Strip planking forms the first layer and is covered by layers of veneer, allowing interior framing to be reduced or eliminated. Strip plank laminating, in a wide range of variations, has been used over the years most often for larger boats. Veneers are added to the strip planked layer usually in a double diagonal pattern (±45°) to provide cross-grained reinforcement. As more layers are added, the need for interior frames is reduced. Many boats in the 20′ to 35′ range are monocoque structures, for which only temporary frames are needed. Compared to a laminated veneer hull, strip construction offers significant advantages. Both methods can be used to build rigid monocoque structures with frameless interiors, but strip plank laminating requires much less labor. Laminating veneer is a more difficult process requiring multiple layers of veneer, each of which must be spiled, bonded and fixed in place until the adhesive cures. The laminated hull is built over a temporary mold which can be as difficult to build as the actual boat. Strip plank laminating uses fewer veneers, the hull shape can be quickly established and only part of the mold is discarded. Some of the largest wood/epoxy boats ever built use strip plank laminating. The 124′ sloop featured in issue #9 of Epoxyworks, and the 65 meter (213′) barque featured in this issue are both variations of the strip plank laminating method. Both use double diagonal layers over strip planking, with a second strip plank layer on the exterior. At this scale, however, the diagonal layers are at least 3/8″ thick and technically not what you would call veneers. Hulls of this size still rely on internal frames and bulkheads for cross-grain support. Strip composite construction is another variation of strip planking. Strips are joined as with the previous variations, but all crossgrain reinforcing is done with a layer, or layers of fabric, bonded with epoxy on the inside and outside. This results in a stiff, strong, frameless, lightweight structure. With single layers of fabric, the epoxy and fiberglass cure clear, allowing the wood’s natural beauty to show. 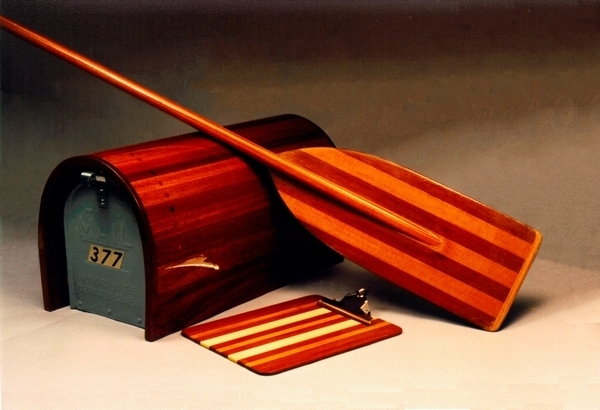 A popular example of strip composite is the stripper canoe. They are usually built of 1/4″-thick cedar strips, planked over temporary frames, with 4 oz. or 6 oz. woven glass fabric inside and out. Though used mostly for smaller boats, strip composite construction is not limited to small craft or to standard boat shapes. Larger custom racing craft, such as the formula 40 trimaran Adrenalin, were constructed this way. Because of its rounded topsides, the hull was built in halves in female mold frames. It used unidirectional carbon fiber reinforcing laid at 90° to the 3/8″ thick cedar strips. There are many variations of reinforcing materials, and many choices of strip composites: When higher density materials such as mahogany, cedar and pine are joined, they contribute to the structure. They provide tensile and compressive strength along the grain, as well as shear strength through their thickness. They are considered an “active core.” Such a core may require minimal reinforcement, depending on grain strength and how the composite will be used. In contrast, an “inactive core” (such as foam strips) is used only as a base for the reinforcing skins. An inactive core gives the structure its shape, but doesn’t add to its strength. A hybrid, DuraKore™, combines balsa core with wood veneer skins in a strip form. One of the advantages of strip construction is the ability to build compound shapes quickly. The strips are typically placed over mold frames that define the structure’s shape. Most shapes can be built in strip construction, although the more spherical shapes are limited by the strips ability to bend in two directions. Strip construction opens up a wide range of building possibilities. We hope the articles within this issue give you some ideas of how strip construction can benefit you in your next project, whether it’s a clipboard, a canoe or a sailing ship. A beautiful cedar strip canoe.